A tall 20-something steps from behind a turquoise curtain wearing a long, satin pink formal dress. The dress may have been–in another decade, perhaps–called ‘elegant’ or ‘classy,’ for the heavily sequined torso and loofah-sized, lace shoulder pads might not communicate sophistication and style by today’s standards. “That’s really cute,” says Audri Thomason, looking back at the girl and smiling from behind a sales counter. The girl in the dated prom dress looks at herself in the floor-to-ceiling mirror facing the fitting room stalls, and her friends giggle and nod in approval. The garment shall be donned at a tacky prom later in the evening. Thomason, 26, is new to the Fayetteville area compared with some of the other women working at Cheap Thrills, a vintage clothing and costume shop situated just off of the downtown square. She moved to Fayetteville from Pennsylvania about a year ago. Soon after, she and her husband decided to purchase the shop from its original owner, Harriet Wells, 61. “We’re going to kind of ‘new’ it up,” Thomason said. Cheap Thrills will remain at its 120 S. East Ave. location, and Wells is expected to continue to work at least part-time at the store. One of Thomason’s main goals is improving the store’s online marketing, which the two women agreed was necessary to lift the store’s sales out of its current slump. An aerial view of Cheap Thrills. 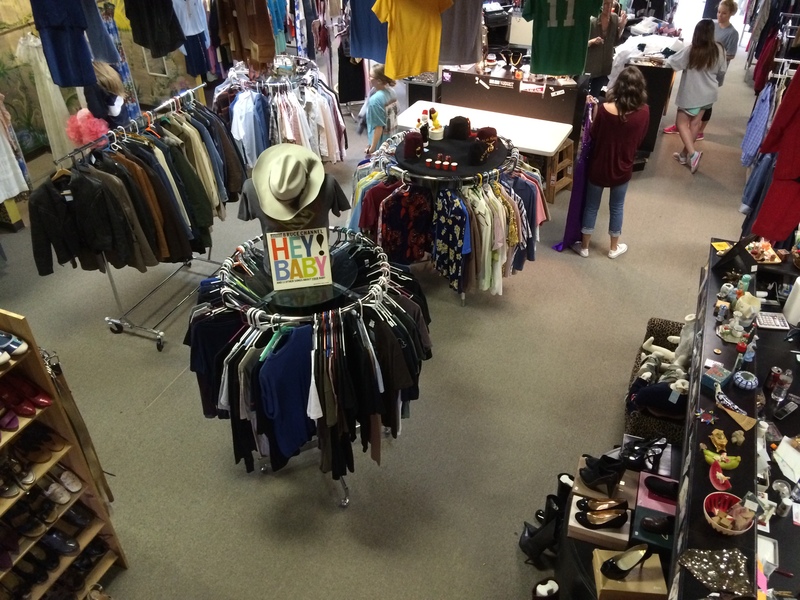 The store sells clothing, costumes and accessories, including shoes, jewelry, hats, and bags. “To be in this market at this day in age, you need to be on Instagram, you need to be on Facebook, and I’m not very much into all of that,” Wells said. True, as other local clothing shops like Belle Boutique and Riffraff take advantage of social media to appeal to the city’s population of university students. Cheap Thrills does have Web pages on Pinterest and Instagram, but under new ownership its online presence is expected to boom. She also hopes to expand upon the store’s costume stock, which currently brings in about a fifth of the store’s customers. Wells and Thomason agreed that it is a huge undertaking. Wells and Thomason agreed that it is a huge undertaking. “It’s nerve-wracking and a little overwhelming because, you know, we’re taking on someone’s baby that they’ve created and of course we want to make them proud and make the community proud,” Thomason said. Audri Thomason, 26, stands in front of the clothes she has collected and plans to sell at Cheap Thrills once she is the owner. Wells is passing along the store’s ownership after 22 years. Thomason and her husband have spent the last few weeks at Cheap Thrills getting to know the employees and the clientele. They’ve also begun cleaning out the upper level, which originally stored extra stock and supplies, and planning for some remodeling of the walls. Thomason said that, eventually, the upper level will serve as a workplace of sorts. Wells opened the store in May of 1992 with the intention of selling name-brand clothes for cheap, as well as furniture, housewares and knickknacks–“kind of like an awesome yard sale,” she said. She scouted out most of these items herself, at first, at thrift stores and yard sales. Now, most of the clothing, shoes, hats, bags, jewelry and costumes come from customers who either donate or sell their old apparel to the store. Most of it is sold in the storefront, but Wells has sold clothing in bulk to various projects over the years. In 1994, not long after Wells opened the store, she received a phone call. It was mostly an ordinary transaction; a buyer wanted to purchase about three dozen blue jeans for a film. Just before hanging up the phone, she asked the man what the film was called. “He said, ‘Forrest Gump.’ And after I hung up, I said, ‘That’s not going to be a hit,” Wells said, laughing. Harriet Wells, 61, stands in front of a few fezzes for sale at Cheap Thrills. She opened the store in 1992 and owned it ever since. She will pass along its ownership to Audri Thomason on April 25. The store was originally located on Block Street and took up all of approximately 900 square feet. Wells spent five years there before relocating to accommodate for her growing business. She also sought to provide a haven of sorts for shoppers that would enable them to open up and have fun upon entering the shop. That particular goal of Cheap Thrills has held over the years, Wells said, and Thomason said she will continue to promote that kind of environment. Usually, Wells manages just three other employees at one time, although she hires temporary workers for the weeks leading up to Halloween. Dolores Miller, an employee of five and a half years, said that working at Cheap Thrills is one of the most fun jobs she’s ever had. She said she likes interacting with the shoppers. Miller said that the transition of store ownership from Wells to Thomason will be bittersweet. People of all ages come into the shop, including some who shopped at Cheap Thrills in its early years. “I came here while in college, and we would buy stuff for our parties–like, for ’70s parties and all that kind of stuff,” said Laura Hilliard, a University of Arkansas alumni who now lives in Little Rock. The store attracts shoppers looking for outfits for formal occasions, too. One such shopper, Krystiana Crites, 23, said that last May she bought a floral short dress at Cheap Thrills for a wedding. But the store doesn’t just rely upon women for business. The official transition occurred April 25. Thomason said she is determined to improve upon Wells’ legacy. “I want to make her proud,” Thomason said.